Harman’s Martin Professional MAC III Quadray is an all-new, multi-beam effect offering a whole new dimension to the lighting designer toolbox. The MAC III Quadray is tour-tested, having been deployed on Paul McCartney’s latest tour ‘Out There!’ with lighting design by Roy Bennett, among others. The MAC III Quadray allows designers to create a wide variety of looks that would otherwise be difficult to program solely via a lighting console. The MAC III Quadray allows for projection of up to four individually controllable rays of light from a single luminaire, providing new possibilities in static or dynamic mid-air effects. 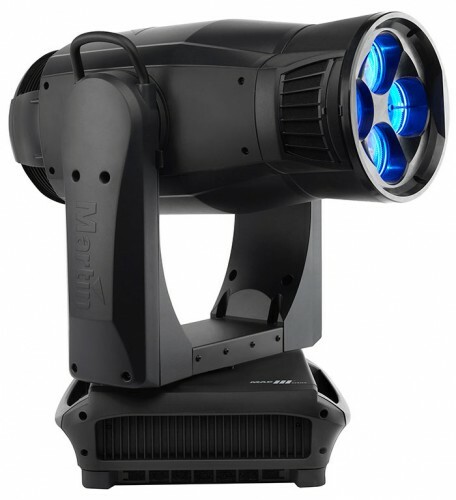 Superior output from a 1500-watt lamp means the MAC III Quadray delivers enough power for even the biggest stages and venues. It houses the same high-quality feature set as Martin’s MAC III AirFX, including a vibrant colour mixing system, stunning aerial effects and a linear zoom with linked focus. Available as an easy-to-install front lens replacement kit for the MAC III AirFX, the lens kit installs (and uninstalls) in only a few minutes, providing flexibility of use and greater value from a single luminaire. The MAC II provides added flexibility and enhanced value for any rental house or lighting designer.